Mayor Housefather, and councillors Nashen and Berku spoke at National Assembly hearings on November 15 to support Bill 22, which contains provisions to save Côte St. Luc EMS. They were joined by EMS volunteers and staff. CSL EMS volunteer medics were busier than ever as availability of Urgences Sante ambulances continues to decrease resulting in longer delays. Often EMS will respond to two or three simultaneous calls for medical emergencies. A recent drowning at a Cavendish Blvd. condo pool is a stark reminder that one must never swim alone. Building security and the superintendent found a man lying face down in the water and pulled him out. Quick action in dialing 911 may very well have saved the man’s life. But prevention is the best means of avoiding an emergency in the first place. Never swim alone! Thanks to our EMS, Public Security and vCOP (volunteer Citizens on Patrol) members for excellent mobilization this Halloween. CSL was patrolled by three EMS crews and 15 vCOPs in vehicles, on foot and acting as crossing guards at the Haunted House at the Samuel Moscovitch Arena. Recently CSL Public Security officers responded to a fire call on Trinity Ave. Arriving before the firefighters, PS officers noticed smoke coming from the upper duplex and forced their way into the residence, rescuing an elderly man. While the cause of the fire is under investigation, we applaud the courageous efforts of officers Stavrakis and Blanchet who went above and beyond the call of duty to assist a resident in need. These two are examples of the superb men and women who serve us day and night as members of the police, fire, ambulance, EMS first responders and other emergency services. We salute them all. 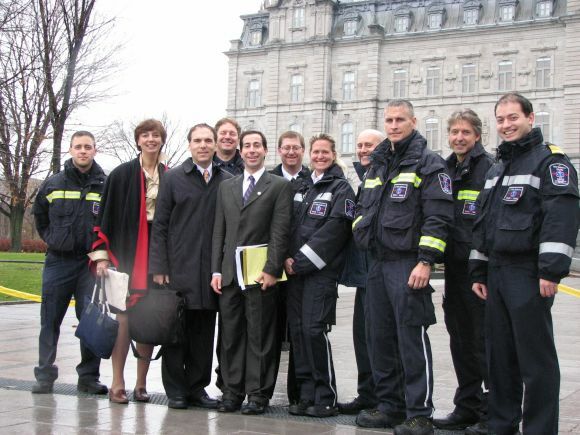 Meanwhile, just last week, CSL Mayor Anthony Housefather testified before parliamentary hearings in Quebec city on municipal reorganization. In an impassioned speech and subsequent exchange with MNAs, the Mayor superbly defended the interests of the City in keeping CSL EMS in place as our first responder service of choice. I accompanied the Mayor, along with Councillor Dida Berku, DG Ken Lerner and EMS volunteers. We made every effort to speak with MNAs to urge them to adopt the proposed legislation keeping CSL EMS in place. We salute our MNA Lawrence Bergman for his pivotal role in this crucial issue. Glenn J. Nashen is the Côte Saint-Luc city councillor responsible for public safety.